This collection of travel stories has been gathered over twenty years of travel and writing. They cover many places and themes, but all circle around the idea of being a stranger in a strange land. As a sample, the stories involve playing street basketball in New York, going underground in Berlin, pushing a boat in Indonesia, chasing ghosts in Vienna, and going back in time on Lanzarote. Shortlisted for three independent publishing awards. Campbell Jefferys reads a section from ‘Postcard from Lanzarote’ at the 2016 launch of Greetings from, Zum Elbblick, Hamburg. 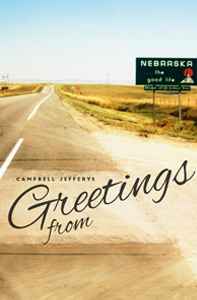 Campbell Jefferys is from a small town in Western Australia. His second book, Hunter, won the fiction category of the 2009 Next Generation Indie Book Awards. He is also the author of The Bicycle Teacher and True Blue Tucker, which won in the Australia/New Zealand fiction category of the 2012 Independent Publisher Book Awards, and the non-fiction travel collection Greetings from.